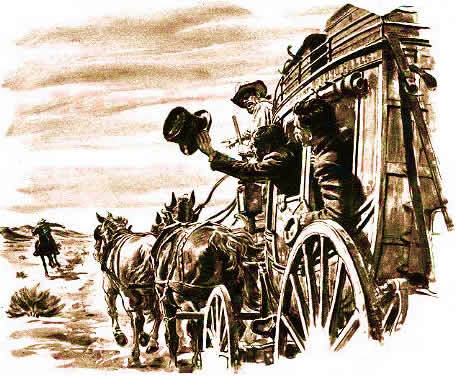 In a little while all interest was taken up in stretching our necks and watching for the "pony-rider"--the fleet messenger who sped across the continent from St. Joe to Sacramento, carrying letters nineteen hundred miles in eight days! Think of that for perishable horse and human flesh and blood to do! The pony-rider was usually a little bit of a man, brimful of spirit and endurance. No matter what time of the day or night his watch came on, and no matter whether it was winter or summer, raining, snowing, hailing, or sleeting, or whether his "beat" was a level straight road or a crazy trail over mountain cragsand precipices, or whether it led through peaceful regions or regions that swarmed with hostile Indians, he must bealways ready to leap into the saddle and be off like the wind! There was no idling-time for a pony-rider on duty. He rode fifty miles without stopping, by daylight, moonlight, starlight, or through the blackness of darkness--just as it happened. He rode a splendid horse that was born for a racer and fed and lodged like a gentleman; kept him at his utmost speed for ten miles, and then, as he came crashing up to the station where stood two men holding fast a fresh, impatient steed, the transfer of rider and mail-bag was made in the twinkling of an eye, and away flew the eager pair and were out of sight before the spectator could get hardly the ghost of a look. Both rider and horse went "flying light." The rider's dress was thin, and fitted close; he wore a "round-about," and a skull-cap, and tucked his pantaloons into his boot-tops like a race-rider. He carried no arms--he carried nothing that was not absolutely necessary, for even the postage on his literary freight was worth five dollars a letter . He got but little frivolous correspondence to carry--his bag had business letters in it, mostly. His horse was stripped of all unnecessary weight, too. He wore a little wafer of a racing-saddle, and no visible blanket. He wore light shoes, or none at all. The little flat mail-pockets strapped under the rider's thighs would each hold about the bulk of a child's primer. They held many and many an important business chapter and newspaper letter, but these were written on paper as airy and thin as gold-leaf, nearly, and thus bulk and weight were economized. The stage-coach traveled about a hundred to a hundred and twenty-five miles a day (twenty-four hours), the pony-rider about two hundred and fifty. There were about eighty pony-riders in the saddle all the time, night and day, stretching in a long, scattering procession from Missouri to California, forty flying eastward, and forty toward the west, and among them making four hundred gallant horses earn a stirring livelihood and see a deal of scenery every single day in the year. We had had a consuming desire, from the beginning, to see a pony-rider, but somehow or other all that passed us and all that met us managed to streak by in the night, and so we heard only a whiz and a hail, and the swift phantom of the desert was gone before we could get our heads out of the windows. But now we were expecting one along every moment, and would see him in broad daylight. Presently the driver exclaims: "HERE HE COMES!" Every neck is stretched further, and every eye strained wider. Away across the endless dead level of the prairie a black speck appears against the sky, and it is plain that it moves. Well, I should think so! In a second or two it becomes a horse and rider, rising and falling, rising and falling--sweeping toward us nearer and nearer--growing more and more distinct, more and more sharply defined--nearer and still nearer, and the flutter of the hoofs comes faintly to the ear--another instant a whoop and a hurrah from our upper deck, a wave of the rider's hand, but no reply, and man and horse burst past our excited faces, and go winging away like a belated fragment of a storm! So sudden is it all, and so like a flash of unreal fancy, that but for the flake of white foam left quivering and perishing on a mail-sack after the vision had flashed by and disappeared, we might have doubted whether we had seen any actual horse and man at all, maybe.